Disclosure: This is a sponsored post. All opinions stated are genuine and 100% my own. HoneyBaked Ham allowed me to make an entire feast in less than 30 minutes! I like to cook for a huge house full of people, the more-the merrier if it's friends and family! Making tummies happy, makes people happy but let's face it, big dinners are a lot of work! I don't know about your family, but in ours we have grown kids who live in different states. They drive or fly in for the holidays, and I love love love cooking for them, but because our time together is so rare, what I want to do more is visit!! HoneyBaked Ham has made both possible. I can get a huge, beautiful, and absolutely delicious feast (we're talking a huge, entire meal!) on the table in 25 minutes flat. I know because I timed it. is full of delicious choices! We recently went to visit our local HoneyBaked Ham in Ann Arbor, Michigan. Because we went on a work night, and the traffic is much busier there than it is in our little town, we were pushing it! Seriously, we got there within just a couple of minutes of closing and the two (very nice) ladies working there would have been well within their rights to tell us they were closing up shop. I knew what time they closed...but when my husband asked if they were closing up, they told us very cheerfully that no, no...go ahead and shop, and take your time. What?!?!?! More excellence points for a store we already love. We were courteous and made our visit short. Short on time... NOT short on delicious choices! some traditional, some unique (to please everyone at the table). They also have a ton of desserts to choose from, including whole cakes. 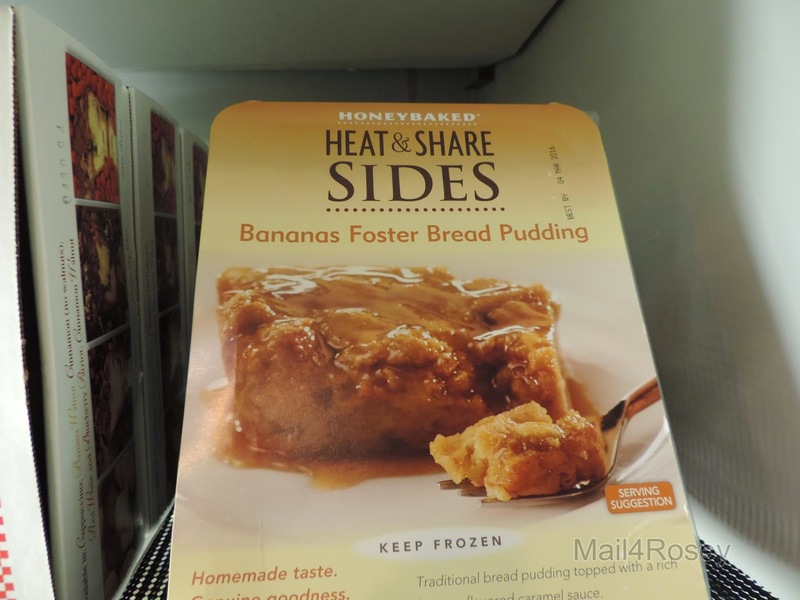 I have never had bread pudding, so I thought it was exciting to come across one! HoneyBaked Ham is a store that carries absolutely everything you need for a fast, perfectly cooked, easy to heat-and-serve meal fast! And no one has ever had anything HoneyBaked in my house and not left raving about it. They have a whole array of Heat & Share side dishes, perfectly cooked, absolutely delicious, and ready to get on your table fast. From traditional to unique, there is something (a lot of somethings, in fact) for everyone. They also have a great selection of desserts to choose from, to make that meal complete! Everything is top-notch, but the star of the show, is always the meat. in less time than it takes to watch a half an hour sitcom on TV. I like that... a lot! The real star of the show, however, is always the meat! 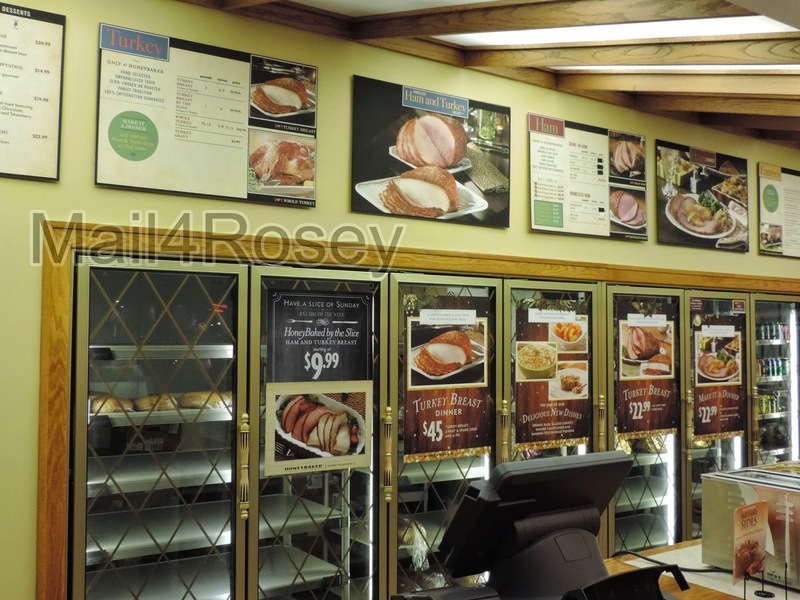 The name may be HoneyBaked Ham, but the store also specializes in succulent turkey meat! They have whole turkeys that are entirely cooked, but everyone in our family likes the white meat, so we opted to get the breast. We also have ham lovers in the house (if it's a holiday, there's gotta be a ham on the table) so we opted for a nice-sized portion of the already perfectly sliced ham. The secret to the 'Oh my gosh, this is so goooooooood' remarks comes from the crunchy glaze crust on the outside of them both. 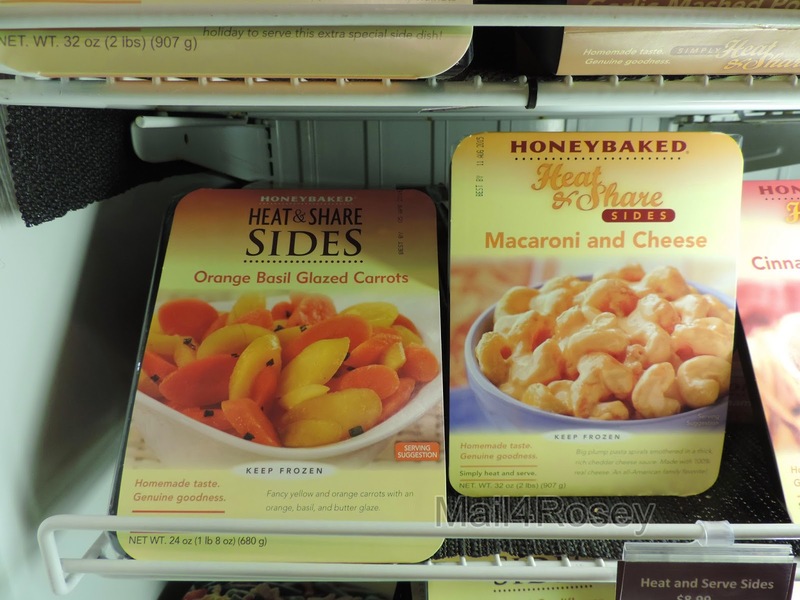 If you're looking for a way to serve a wonderful, memorable meal but you want to spend more time with your family than in the kitchen, HoneyBaked is definitely the way to go! A Coupon & a Giveaway! From now until 1/11/15 you can enter to win a $25,000 HoneyBaked Kitchen Makeover when you buy a Ham and Turkey Breast bundle. Check out this amazing limited time coupon for $8.00 off any Bone-in Ham and Turkey Breast or Boneless Ham and Turkey Breast from HoneyBaked Ham to help you make your holiday dinner easy and delicious! (This offer is valid only at the following locations: Rolling Meadows, Orland Park, Villa Park, Morton Grove, Naperville, Chicago, Dallas, Fort Worth, Arlington, Plano, Mesquite, Hurst, Lewisville, Houston, Austin, Spring, Clear Lake, Sugar Land, Indianapolis, Ferndale, Grand Rapids, Roseville, Birmingham, Troy, West Bloomfield, Livonia, Flint, Dearborn Heights, Sterling Heights, Taylor, Ann Arbor, Canton Township, Oklahoma City, Pittsburgh, Mechanicsburg, Monroeville, San Antonio, Bellevue, and Lynnwood. For store addresses click here.) HoneyBaked Ham is giving away $500 in Gift Cards to some of your favorite places! You can enter below! 25 minutes isn't bad indeed at their feed with such speed. That turkey looks delicious. I think if I were in a huge time rush I would definitely use this service. This is one of my sisters' favorite places to grab a sandwich. She is vegetarian and though they have ham and turkey, they also make a few great vegetarian sandwiches. She is not a vegetarian by choice, she is allergic to almost every cholesterol medication out there, so she did it for her health as an adult. Really she never ate meat as a kid, until she was about 16 and kids she hung around with were always buying pizza's. So since she didn't eat meat mom made sure she got other proteins in her instead. She was skinny as a kid. Then she marred and started eating meat because her husband did. Yet, later on after she had her babies, her Doctor said, whoa your cholesterol is super high. So she controls her levels with her diet. She's treated me at their in store luncheon more than once. I've tried their vegetarian sandwiches, they are good, but I prefer their Honey Baked Ham. Love my younger sister, she's amazing. I'd be impressed by her even if she wasn't my sister. Impressed with Honey Baked Ham as well. Twenty-five minutes is indeed fast. I am impressed to hear that they don't ignore us vegetarians either. I have vegetarians in my house too so I'm always happy when companies help feed them! Honey baked ham is one of the best things about this time of year. Well, that and leftovers! This is perfect for the holidays. We used to get a ball of ham every Christmas because my husband and I love it. I haven't tried cooking the ham myself but 25 minutes in the oven, I can give that a try. I really wish we had one of these stores near me-I would be there all the time if only for the sides. That Ham looks delicious. I'd probably pick up some desserts too----any chance of them coming to New York? I love their hams. This is an awesome meal! I agree they make the best tasting hams. Their side dishes are also really tasty! I have heard a lot about the Honey Baked Ham, but never tried this brand. We usually Honey bake our own. Honeybaked is great and the way to go! Your company won't have more fun if you're chained to the stove cooking during the holidays! I'd love to win lunch, dinner, lunch, and dinner at HBH. Entered! Enjoy your company during the holidays. :) Unfortunately, it doesn't look like the coupon is good in my area. But, I think I have a gift card to the store and really need to check it out! We are baking a chicken this year and having cheesy potatoes. It's just hubby and I and we're looking forward to not doing all the work we've been doing for the past 25+ years. Yes we are. I love Ham! This looks delicious! Growing up, my mom always got a Honey Baked Ham. Sadly, our local store closed a few years ago and they are not so easy to come by anymore. I have never tasted a Honey Baked Ham but I hear they are delicious. Thank you for this giveaway. Talk about an easy feast! Those sides are perfect for whipping up a quick dinner. I had no idea they had all those delicious-sounding sides! Bananas foster bread pudding??!! Yum! Now that is the way to have a feast. All the yum without the fuss. I like ham more than i like turkey so this would be perfect for thanksgiving. i'll have to check it out. Now that's one heck of a giveaway! I We just had ham for dinner and said we need to be eating more of it because it's just so darn delicious! Their hams are so delicious! YUM! What a great giveaway for the holidays! That is wonderful for someone to win! I entered your giveaway. We love Honey baked Ham! I've never had Honey Baked Ham before but it sounds delicious. Thanks for the great giveaway! I have a Honeybaked Ham right up the street from my house but have never been there. That looks so delicious though. I may have to stop in! Thanks for the giveaway! Love honeybaked ham with scalloped potatoes and corn. Actually just looking at that makes me wish I had of put it on this weeks grocery list! 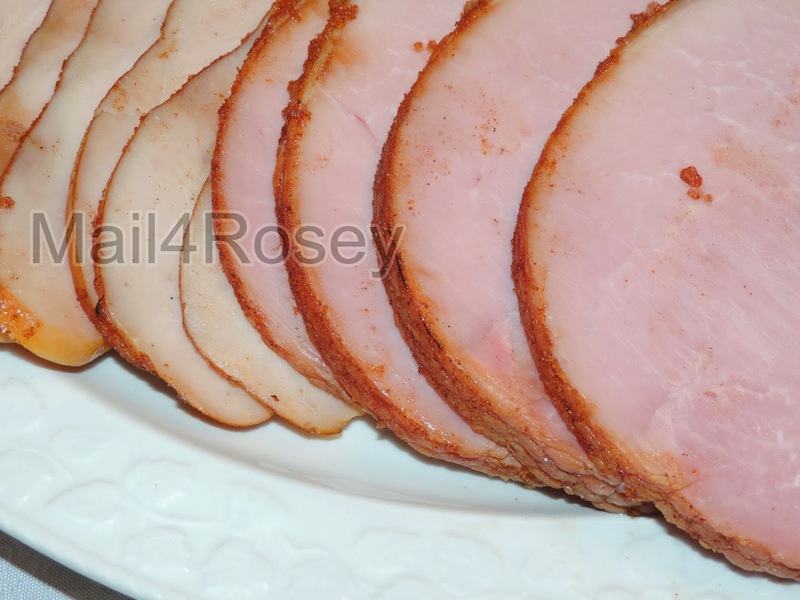 Honey Baked Ham is one of my favorites! What an inexpensive and delicious meal! We're having ham with my Mom for Thanksgiving. I love that it can be done in such a short amount of time. Honeybaked catered my daughter's wedding rehearsal. I love their ham way more than the kind we usually have at Thanksgiving, but don't tell the family member that makes the ham, lol. I so wish we had a store close by. I would defiantly be using it. We always host a huge meal and this would sure help. This is one of my favorite places! I Wish I had one in my town! Thanks for the giveaway! We love HoneyBaked Ham! It has probably been five years since I've had their ham. This needs to be rectified immediately! Yum I haven't had ham in YEARS! I have no idea what bananas foster is but it looks delicious and like I need to try! Oh wow! This looks delish! That bananas foster bread pudding looks to die for. I need that! This is such a great idea. Getting all of the holiday meals together is a hard job! I love Honey Baked Ham! I really want to drive to my local store to get some! Now I'm really really hungry for some ham! I have never had their hams before but I have heard great things about them. Sounds really tasty! We have a honey baked ham about twenty minutes away and I have always wanted to go. This looks amazing. Looks delicious, and what a great giveaway! I just ordered my Honey Baked Ham and turkey breast yesterday! They always make for a yummy Thanksgiving! Wow this looks like it would definitely save time to have the ham brought in. It would save some money too. Their hams are my husband's favorites. This is a great giveaway. Thanks! With all of us being so busy many times, a meal in 30 minutes definitely sounds like a life saver for sure! Yum! With the holidays being always busy, this is definitely perfect. Quick and easy! That sounds like a great store. I love a good honey baked ham for the holidays. We're not much of a turkey fan so we always get ham during Thanksgiving. Thanks for sharing the review. I printed the coupon I found at the bottom of your blog. I love a good HoneyBaked Ham! They are a staple at our Christmas table each year! Oh my goodness, we love Honey Baked Ham! What a fun giveaway too! I had no idea there was an actual Honey Baked store. That's pretty neat. Sadly we don't really eat ham in our house. This is a great idea, many people do not have hours to spend making a festive meal. You provided a great alternative . I've been learning to cut myself a break once in a while and buy some things premade. As long as it's good quality, right? And this looks like it is! I absolutely love Honey Baked Hams! I am always trying to get my parents to agree to let me just bring one for Christmas dinner. They're so good! 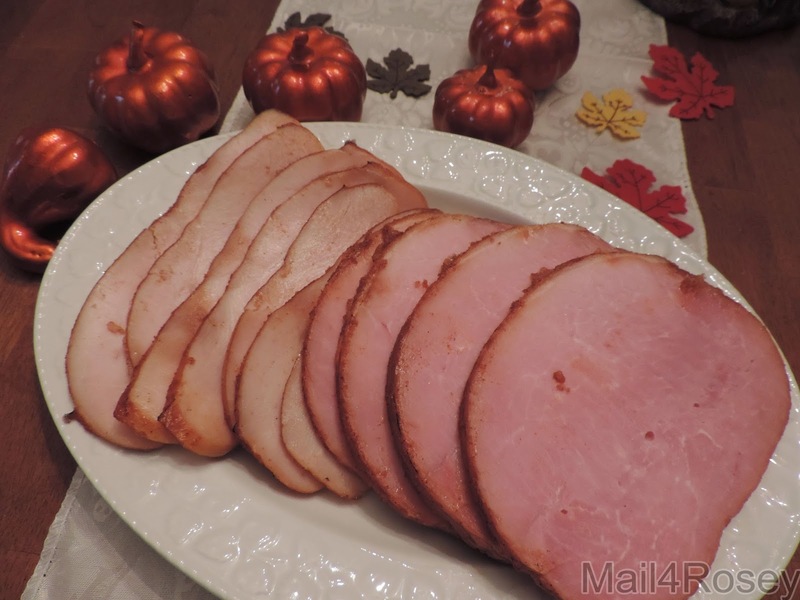 We love honey baked ham year round at our home! Now I'm drooling and want some for lunch! I have used their sides as my own for years and it is our "In the house" family secret! 30 minutes is awesome! Ah looks so delicious! And in 30 minutes? That's awesome! What a great way for a quick dinner. You don't just have to do it for the holidays either. Everything looks so delicious! What a great dinner in 30 minutes. I am impressed. It looks great. Anything that helps make the thanksgiving meals easier and tastier is something I want to learn more about. Need to check this out more. Now this is a giveaway I'd LOVE to win! Honeybaked Ham is delicious. I dont eat pork very much but around the holidays I always get an urge to sneak and taste a piece of honey ham! This will be great for Thanksgiving! I love Honey Baked Ham products. They would be perfect for Christmas or Thanksgiving! Good idea for busy families! Can't beat the quickness of this honey baked ham! This is such a great idea for a holiday meal, I am thinking maybe Christmas time. I love the sweeps they have too, I could use a kitchen makeover. Nothing better than HoneyBaked for the holidays!